We provide eyeglass exams in the Santa Rosa Costco. Bradley I. Hall, OD, PC is an independent optometry office inside the Santa Rosa Costco that provides professional and friendly eye exams for eyeglasses, contact lenses, LASIK or eye health concerns. 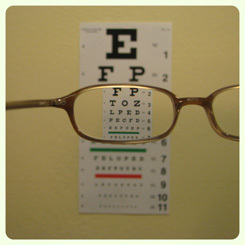 You do not need to be a Costco member to be examined by our optometrist. After the eyeglasses examination, our patients have the freedom to take their eyeglass prescription to the optical of their choosing. Most patients choose to take their prescription to the Costco Optical located next to our office. Costco Optical departments provide a good value on eye care materials and received the top rating from Consumer Reports during their most recent review of opticals.